Together, the four volumes in this groundbreaking handbook constitute the first comprehensive, interdisciplinary analysis of the biopsychosocial factors that impact normal and abnormal infant mental development. Assembled under the auspices of the World Association for Infant Mental Health (WAIMH)--the leading international organization in infant development--it brings together contributions by the world's leading infant mental health researchers, clinicians, and scholars, who share their findings and observations on the gamut of psychological, social, emotional, cultural, and biological factors that influence normal and abnormal mental development in very young children. 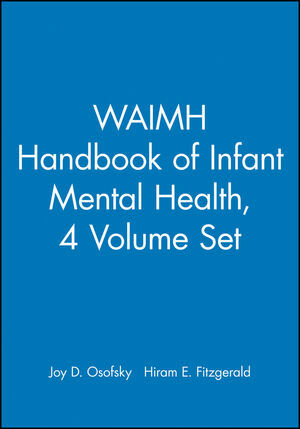 Joy D. Osofsky is the editor of WAIMH Handbook of Infant Mental Health, 4 Volume Set, published by Wiley. Hiram E. Fitzgerald is Associate Provost for University Outreach and Engagement, University Distinguished Professor of Psychology, and Adjunct Professor in Human Development and Family Studies at Michigan State University. Toward a Theory of Early Relationship-Based Intervention (R. Emde, et al.). Relationships for Growth: Cultivating Reflective Practice in Infant, Toddler, and Preschool Programs (L. Gilkerson & R. Shahmoon-Shanok). The Assessment of Infants and Toddlers with Medical Conditions and Their Families (K. Minde). Infant Mental Health Assessment Through Careful Observation and Listening: Unique Training Approaches (D. Weatherston). 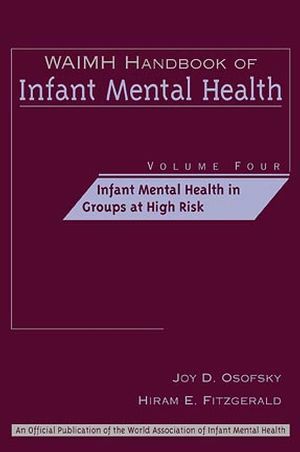 Preventive Infant Mental Health: Uses of the Brazelton Scale (J. Nugent & T. Brazelton). The Assessment and Diagnosis of Infant Disorders: Developmental Level, Individual Differences, and Relationship-Based Interactions (S. Greenspan & S. Wieder). Clinical Assessment of Infant Psychopathology Challenges and Methods (M. Cordeiro). Evaluating Mother-Infant Psychotherapies: "Bridging the Gap" Between Clinicians and Researchers (B. Cramer & C. Robert-Tissot). Advanced Training in Infant Mental Health: A Multidisciplinary Perspective (K. Frankel & R. Harmon). Assessing the Risks and Strengths of Infants and Families in Community-Based Programs (S. Landy). Training Mental Health and Other Professionals in Infant Mental Health: Conversations with Trainees (J. Pawl, et al.). Intervention-Centered Assessment: Opportunity for Early and Preventive Intervention (J. Thomas, et al.). Observation, Reflection, and Understanding: The Importance of Play in Clinical Assessment of Infants and Their Families (E. Tuters & S. Doulis). Assessment of Temperament in Infancy (J. Worobey). Meeting a Desperate Need: One Man's Vision of Training for the Infant Family Field (F. Stott & L. Gilkerson).